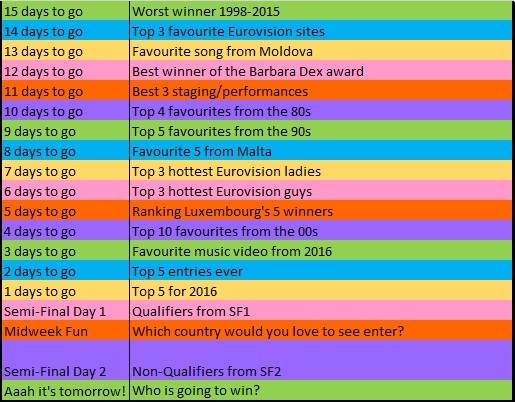 Oh my good god we are 5 days to go till Eurovision 2016 Semi Final Number 1 and I am very excited. The first rehearsals are now over for all those seeking qualification and it was exciting to get a taste of what is to come! 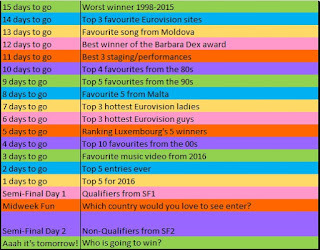 For the last few years I've been bogged down with essays and revision and its finally so exciting to throw myself head first into the rehearsals and enjoy Eurovision prep week for all it's worth. Well getting a great big fat A* from me is Jamala and Ukraine with '1944'. Anyone who has followed me knows I absolutely hate the song, BUT she has so brought it to Eurovision. Everything is there and I'm sure once we are a couple of hours away from the final I might have to accept the fact that she could win, even if I don't personally like the vocals. I adore this record. I get lost in the juxtaposition of an uplifting beat, lyrically rich in tragedy. It's a real tough tussle for 1st and 2nd with me, but my number one edges it for the vocals. Nothing should detract away from how fantastic this winner was from 1965. Poupee De Cire Poupee De Son may now be a touchy subject for France herself, but it was the first non-ballad to win and ultimately change the shape of the contest. One of the best winners ever? It's certainly up there for me. I never use to appreciate this, but after one proper listen I implore you to not have this stuck in your head. Top 10 from the 00s - 4 days to go! Fiercest Eurovision Ladies... 7 days to go! Favourite 5 from the 1990s - 9 days to go!